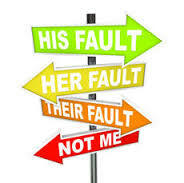 Understanding psychological projection in relationships, either in the form of simple projection or projective identification, is only useful to the degree that it helps you get more of what you want. If all you do is pin a label on your partner or yourself, the result most likely will be more harmful than helpful. However, if you can use it to be more understanding and to make your relationship a safer place to be for both partners, then it's good. Simple psychological projection is most often described as an attempt to cope with anxiety caused by having unpleasant or frightening thoughts, feelings, and/or impulses. This is attempted by keeping the unwanted thoughts, feelings, and/or impulses out of your own conscious awareness, and seeing them in others. In other words you project them onto another person. Some people find it helpful to think of three subtypes of projection. If breaking the concept down further in this way is helpful for you, use it. Otherwise, don't get tangled up in the details. When you experience projection in your relationship it is very confusing. When one of the partners is taking their own worst fears about themselves that they don't even know they have because they don't want to have them and seeing them in their partner without being aware they are doing it, . . . the result is likely to be even more confusing than this sentence. Apparently this something that we all do to some degree, especially when we are under stress, so it is worth some effort to have a plan for dealing with it. 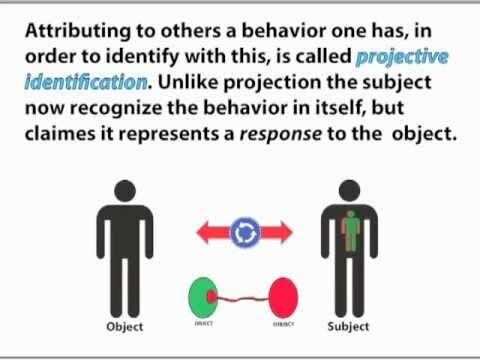 Projective identification is very similar to simple projection, but it involves a bit more self-awareness and is reasonably grouped under the heading of projection in relationships. When projective identification is functioning, the person is aware that the feelings, thoughts, and impulses, are their own, but they label them as natural reactions to what the other person is doing. 'Of course I am angry, selfish, scared, thinking of violence . . . ."
In fact, there often is a logic to the claims. When a person uses this defense style, it is very likely to evoke exactly what the one doing the projecting feared. When the other person reacts, the originator feels quite justified in fighting. Most often the result in such a situation is that no one can really figure out who is doing what to whom. Remind yourself that no one really know what other people are thinking and feeling. Too make matters worse, at a deeper level they very likely aren't that clear on their true thoughts and feelings either. And, that goes for us too with our emotionally driven thoughts and feelings. Remember that the more stress you are under, the more likely you are project your own deep feelings and impulses onto the other person and vice versa. Sometimes the only way you can tell how stressful a situation is for another person is in what they are saying about your motivation, thoughts, impulses. Take it as information. Relationships in which you feel safe exploring your reactions to a given situation (the good, the bad, and the ugly) with the other person are the ones that last and grow. Build that environment when you're not under pressure. It will serve you when you are. Like simple projection, just knowing that it is likely to happen can make a big difference. Use the same techniques as with simple projection. If this is something you realize you do: (1) agree on a signal from your partner that it feels to them like this is happening (2) you promise to stop on getting the signal and (3) be quiet for 2, 5, or 10 minutes (4) don't be developing your argument further during this time. Count on having at least some projection and projective identification going on in your relationships. Keep your eye on the core reasons you are in relationships. Focus on your goals of sharing feelings of appreciation, acceptance, and safety. If you find yourself thinking in terms of being right, of fairness, of justification, etc., watch out! It is a sign that your attention is getting misdirected onto the wrong things and that projection may be involved. What else would you like to see here on this topic ? but it is not required to submit your comment.